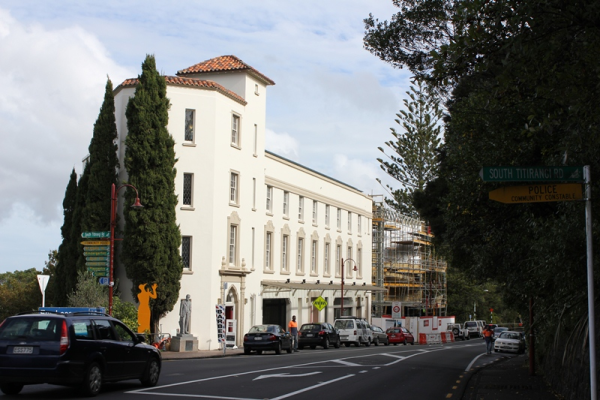 Several months have passed since the great unveiling of plastic wrap from the exterior of Lopdell House, Titirangi, which is part of the newly named Lopdell Precinct. I was curious to see inside the building following its renovation, restoration and seismic strengthening. The entrance foyer, with its floor of decorative tiles and sweeping circular staircase provided an impressive welcome. The ground floor room, which was formerly occupied by Lopdell House Gallery with its wall of arches, windows along its length and highly polished reclaimed kauri timber floor, is earmarked for a café/restaurant. The Upstairs Art Gallery is open on the first floor and offers both member exhibitions and local artist shows in an intimate, light-filled space. Constantly changing views over the Manukau Harbour through sash windows contribute to the ambience. Listen to a soundbite of gallery manager Teena Speedy talking about how the gallery engages with the community. Heritage features retained in the renovation include an original bath from the 1930s Hotel Titirangi. 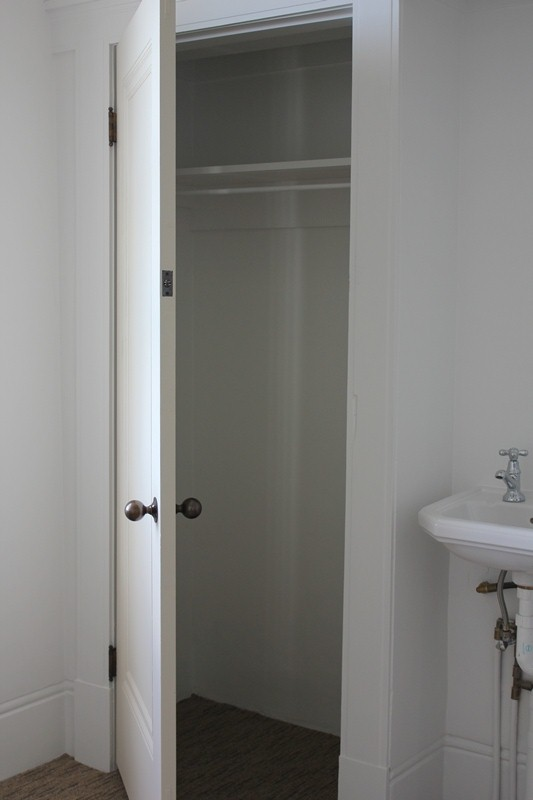 A few original wardrobes from the former Hotel Titirangi are still intact. This room is used for commercial purposes. The last tenant to leave Lopdell House prior to the renovation, and the first to return once work was completed, was barber, Peter Fielder. Book and paper conservator Paul Taylor of Spiral Path Book Studio is a new tenant to Lopdell House. Other businesses currently established in the building range from civil engineers to psychotherapists and massage therapists. The Colin McCahon Trust office is also located here. The original Hotel Titirangi roof terrace has been opened after decades of being enclosed for various purposes, including at one time, a restaurant. Currently used as a viewing platform, it is envisaged it will become a venue for weddings, art exhibitions and the performing arts. Facilities Manager Jolie Hutchings sees the Precinct becoming an arts destination once the new gallery, Te Uru, opens later in the year. Listen to Jolie talk about the facilities currently open to the community. Titirangi Theatre, which will occupy the basement of Lopdell House. Commissioned by: Lopdell House Redevelopment Trust and Auckland Council. See: previous blog post on Lopdell House (24 January 2014), for references and links to books held in Auckland Libraries and documents on the history and renovation of Lopdell House.